We have a special treat for this month’s Fight Card release. 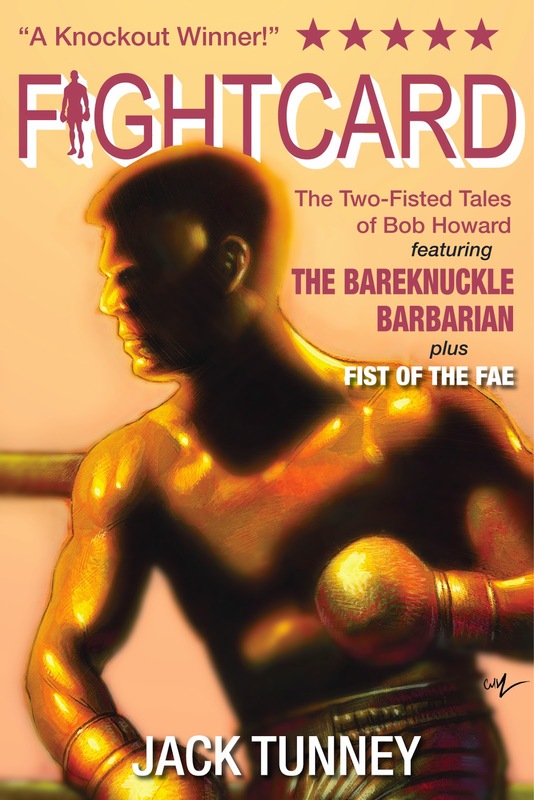 Fight Card: Bareknuckle Barbarian features a one-two punch of stories featuring Robert ‘Bob” E. Howard himself as the two-fisted hero of his own pulp tales. Award winning author Teel James Glenn writing as Jack Tunney gives life to the wonder of what adventures Bob Howard might have enjoyed had his life not ended so tragically early. Fight Card: Bareknuckle Barbarian sports a beautiful painted cover by Carl Yonder with text by David Foster. Can a poor Texan pulp writer survive the bare knuckle brutality of New York? Robert E. ‘Bob’ Howard is forced to find out when he stumbles upon an impromptu match in an alley on his first day in the Big Apple. From there, it is a trip to the circus and a confrontation with a gambling overlord climaxing in a bloody fight to the finish in a squared circle of death…all before landing on the shores of old Ireland, where he will face a strange and ancient danger in a very different circle of bare knuckle justice. Two fisted tales straight from the days of the pulp excitement, served with a side order of ‘what might have been’ fantasy, as Robert E. Howard – the writer who gave us Conan and Solomon Kane – lives his adventures himself. Pulp Award winning author Teel James Glenn writing as Jack Tunney takes the readers back to a time that never was for adventures that should have been! As always, any mentions on your blogs or social networking sites are appreciated. Next month will feature a new Fight Card novel, The Guns of November, from Joseph Grant (The Last Round of Archie Mannis), which mixes boxing with historical characters involved in the Kennedy assassination. The Iron Fists of Ned Kelly will debut in November from Fight Card stalwart David Foster (King of the Outback, Rumble in the Jungle), taking us back into the bush with Australia’s favorite outlaw. This novel will feature a stunning cover from new Fight Card contributor Mike Fyles. Andrew Salmon (Fight Card Sherlock Holmes: Work Capitol) will be giving us a new Fight Card Sherlock Holmes tale to celebrate the holiday season. David Foster is hard at work preparing those Fight Card tales not yet released as paperbacks for publication. Your patience is appreciated. We will get there.